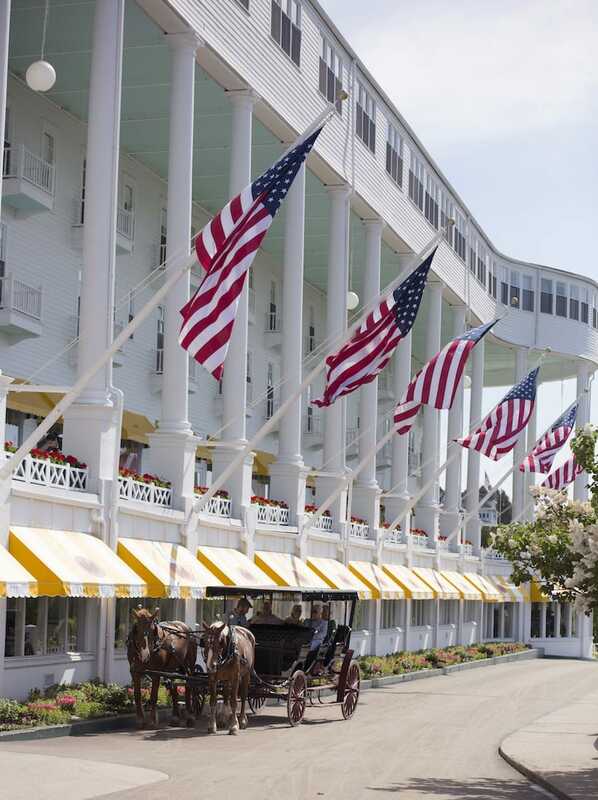 Grand Hotel will open its doors for the 132nd season on Friday, May 4. The 2018 season will debut two newly designed Named Rooms, along with the opportunity to experience Grand Hotel like never before with a variety of special packages, themed weekends and unique summer experiences. Two guest rooms have been reimagined by the hotel’s longtime interior designer, Carleton Varney of Dorothy Draper & Company in New York into the Prentiss M. Brown Suite and the Lilac Suite. Room 320 honors former Michigan Senator and U.S. Representative Prentiss M. Brown, who was a prominent figure in state history and considered the “father” of the iconic Mackinac Bridge. Brown is also grandfather to Marlee Brown, wife of Grand Hotel President Dan Musser, III. Decorated in rich red tones, the room comes alive with family artifacts and historic memorabilia set against a mural of the Mackinac Bridge. Room 318 pays homage to the signature flower of Mackinac Island, which is home to a flourishing variety of lilacs that are celebrated each year when thousands of visitors converge for the island’s largest summer event, the annual Mackinac Island Lilac Festival. With vibrant spring shades of lilac, the Lilac Suite features breathtaking views of the Straits of Mackinac and Grand Hotel Tea Garden. Additional renovations to Grand Hotel include significant upgrades to the hotel’s bustling kitchen facilities and the installation of custom trellis wallpaper in the Art Gallery and guest room hallways. Guests of all ages can find a special weekend package to match their interests, from the annual AAA Memorial Day Weekend and Ballroom Dancing Weekend to the Murder Mystery Weekend, with special packages for everything in between, ranging from wine appreciation, an Old Fashioned Fourth of July Celebration, Labor Day Jazz Weekend, golf and more. For more information on available 2018 special packages at Grand Hotel. All new this year is the Grand Princess and Superhero Package, July 8–10. Families should arrive ready for a royal reception, sing-a-long and goodnight stories, princess charm school, superhero training, and Afternoon Tea. For more information or to make a reservation, visit www.grandhotel.com or contact Grand Hotel directly at 800-334-7263 or reservations@grandhotel.com.